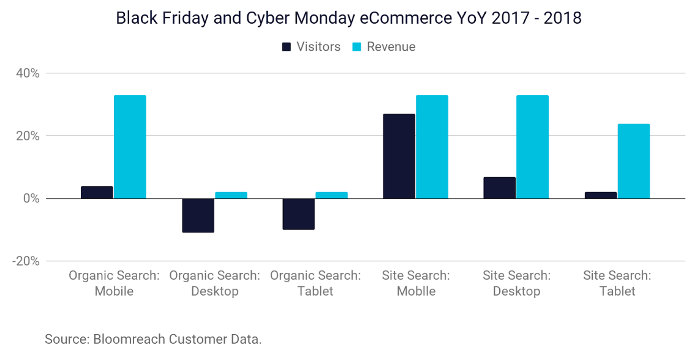 Holiday shopping is commerce on steroids, with an estimated 165.8 consumers shopping between Thanksgiving Day and Cyber Monday in 2018. This one weekend in November gives us a data filled snapshot of not only what customers are shopping for but how they are shopping. As you’re reading an article about eCommerce best practices, you’re probably no stranger to the idea that online shopping is trending upward. 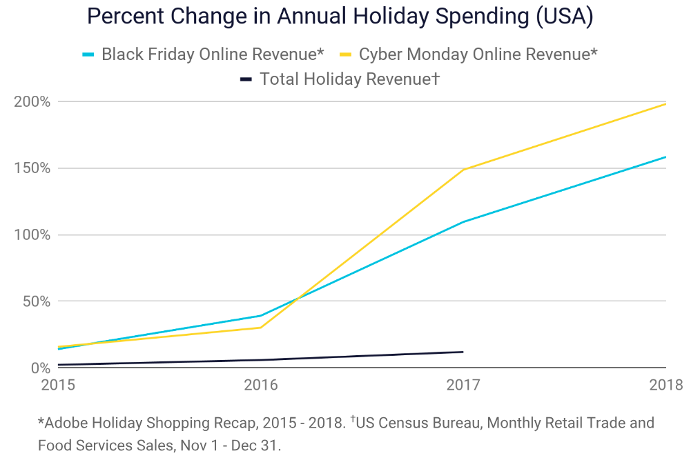 The $14 billion eCommerce revenue over the 2018 weekend is still just a portion of the $1 trillion holiday spend, but when compared to the 3-5% annual rise in total holiday spending, the the speed of eCommerce growth is pretty staggering. Clearly, people are embracing online shopping in droves. Taking a look at behavioral trends over this critical week can help guide year-round eCommerce best practices. Beyond just being present on many channels, omnichannel commerce let’s customers seamlessly bounce from one interaction to the next - Jane browses the selection of tents online, she heads to the brick-and-mortar store to check out the one she likes, she compares different tents on her phone while in store, she realizes she wants the larger tent that’s not in stock, the sales associate finds the larger tent at a neighboring store and places an order that is shipped to Jane’s home. 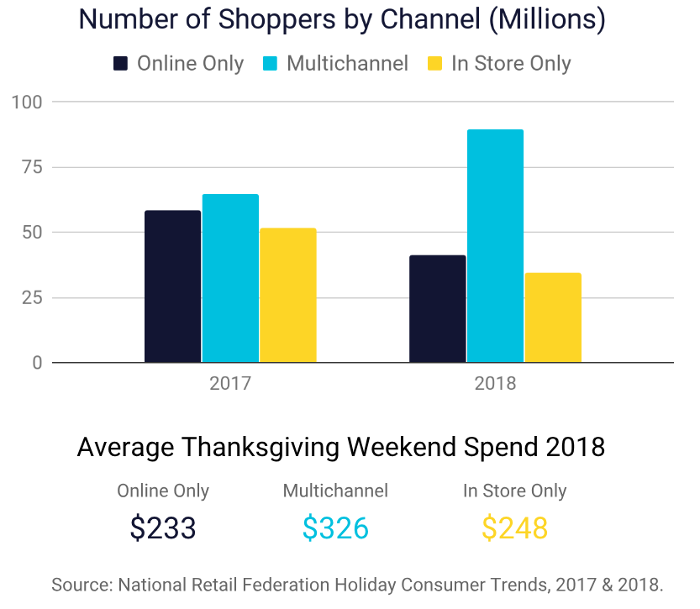 Correlating with the rise of online shopping, this hybrid style of hybrid shopping is on the rise (and interesting to note that it was only in 2017 that the National Retail Federation added “shopping both online and in store” as an option in their annual holiday trends survey). What’s more fascinating is that the hybrid shoppers are spending more. It pays to be connected. Knowing that customers interact in multiple channels is not new, but the speed of eCommerce adoption hasn’t given businesses a lot of time to get the data in order. In 2012 Google thought the idea that people use multiple screens in a day was novel enough to do research on - 7 years later and business are supposed to have those screens fully connected. So in less than a decade retailers have been expected to connect their legacy systems with quality data, create new shopping channels, get a whole company on board with a new way of working, build a cohesive brand experience across everything and, of course, do all this without any disruption to business. Unsurprisingly, this hasn’t been a smooth process for the majority of retailers. Allows transformation to happen in steps without ripping out the whole tech stack. Adapts quickly to whatever customer touchpoint comes next. Enter the rise of API-led commerce. APIs act as contracts between your different applications - website, product information, transactional system, customer data - as to how they will share and structure data. Basically, APIs are the Rosetta Stone of data that let all your systems talk to each other while still being independent. Our whitepaper on API-led Commerce go more in-depth about how retailers are using APIs to remove barriers associated with legacy systems and adapt the customer experience quickly. Organic: Visitors who enter via organic search and come to a landing page with products automatically displayed to reflect their (often longtail) search terms. Site Search: Visitors who use Site Search and see relevant results based on a blend of browsing behavior, customer trends, business goals and an algorithmic understanding of matching intent to search terms. A whopping 27% more mobile visitors used site search this year, but the rise in revenue from those visitors was on par with the rise among desktop & mobile channels that saw a 7% and 2% rise in search visitors, respectively. One potential explanation is that these mobile searches are largely on-the-go research, with over half of consumers using smartphones in store to look up product information. Fascinatingly, while there was a small rise (4%) in mobile users entering via organic search the revenue from those visitors shot up by 33%, compared to a 2% rise in revenue from both desktop & tablet users. Your mobile site is doing double duty. Bulking up on product information, images, reviews, and other helpful content helps out those on-the-go researchers, and having clean metadata drives more relevant products to the top of the landing page for those entering via organic search. Mobile shoppers are searching, and they are going to use a wide variety of search terms. Whether they are searching for “blue sweater”, “navy jumper”, or “indigo cardigan” you need to understand them. High-quality search requires a high-quality synonym list that keep up with trends in language use - we recommend AI. Side note: a good synonym library can also identify misspelled words - helpful for those of us who struggle with those tiny phone keyboards. If Jane sees a green tent in the store and can’t find it on her phone to compare product information she is going to be frustrated. If Joe enters via organic search, ready to buy, and the first 5 products he sees are out of stock he’s going to be frustrated. Mobile users aren’t giving you much of a second chance, with 73% of consumers switching from a poorly designed mobile site to an alternative mobile site that makes purchasing easier. Connecting product, inventory, and behavioral data (especially with a search solution that automatically ranks relevant results for each visitor) makes for a more enjoyable experience.